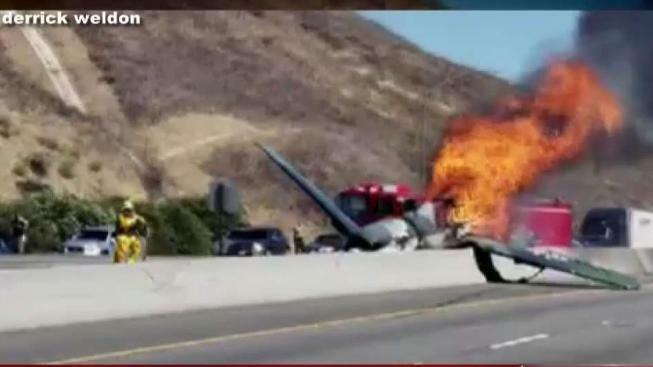 A small vintage plane crash-landed on lanes of the 101 Freeway in Agoura Hills Tuesday, bursting into flames, and amazingly, the pilot walked away. The North American SNJ-5 airplane with the pilot aboard as the solo occupant crashed near the center lanes of the northbound 101 Freeway near Liberty Canyon Road around 1:15 p.m., according to the LA County Fire Department. The plane's wing, still aflame, was draped over the center divider as crews worked to extinguish the blaze and amazed commuters recorded video. The back end of the plane appeared to be missing as the fire continued to burn on lanes. It took off from Van Nuys Airport, a spokesperson confirmed. All lanes were to be closed for an unknown duration. Traffic on the northbound side was backed up for miles as crews worked to clear the wreckage. The vintage aircraft featuring German markings on the wings is usually seen in parades and belongs to the Condor Squadron club, Van Nuys Airport said. The club non-profit organization -- founded by WWII pilots in 1965 -- is dedicated to preserving aviation history. The FAA and National Transportation Safety Board were investigating the crash.